Transnational mobilization for the rights of migrants and against fascism. Originally published by Rete Solidale Pordenone. Note: Presence Counts is not organizing any of these events, we are publishing this text for people across the US and Europe to be able to see what is going on and for documentation only. Gorizia is by its nature a crossing point in the centre of a common territory, which was always, and is nowadays more than ever, transnational, multilingual and multicultural. It is not a coincidence that diverse nations in this city stood together to stop the rise of Nazi after the fall of the Fascism in September 1943. For the same reasons, Gorizia is also under constant pressure of nationalisms, of racism and fascism. A hundred years ago in its surrounding area there used to be the most bloody battles of the First World War, which left hatred and false divisions behind. In the past weeks this contrast was evident as never before: we could witness the civil war of institutions against the migrants who found shelter in the Bombi gallery – the gallery that years ago used to be a shelter for people during Second World War bombardments. This gallery is a symbol and a proof of the past and actual Fascism. A proof that can be summed up in one word: INHUMANITY. transforming the person who comes from somewhere else into an object of miserable political campaigns, stirring up xenophobia and intolerance. This inhumanity has already many faces and too many responsibilities. On the one hand, we can notice an obvious inhumanity, claimed by the mayors of Gorizia and Pordenone and their councils – among the members of the councils there are persons who have no problem sharing the table with whom openly praises Fascism. On the other hand it is also true that the tragic situation of the migrants in Italy, Europe and African countries facing the Mediterranean, is a result of precise choices. the military interventions and sale of weapons by the European Union countries, which perpetuate a state of permanent war in the countries from which migrants are forced to escape. From Gorizia we can and we want to start renewing the idea of humanity, reconstruct the concepts of hospitality, mutualism, mutual recognition and universal equality. learning to change through mutual recognition, all of us, HUMAN BEINGS, BORN EQUAL ON THE ONE AND UNIQUE PLANET. To reaffirm these principles of universal humanity, in Gorizia we are starting a common transnational fight with common mobilization, which starts on the border crossing Casa Rossa/Rožna dolina, on Saturday, 16 December at 15 h.
The attacks in Paris, Beirut, Bamako, Tunis and on a Russian civil aircraft over Sinai, the developments in Brussels and the war-ghosts that cruise through the media and politics in Europe, serve simultaneously to impose the new border regime, pass laws that criminalize civic disobedience and protest, stop the transnational mobilizations for climate, and legitimize state’s racist practices. A wicked political swiss-knife threatens not only to tear societies and humanity apart some more, but also to cut through their resistance. We all have a choice, though. We can let division win and bear its consequences for the decades to come. But we can also declare a state of solidarity, committing to recognize and support struggles for peace, freedom and dignity. In this context, it is imperative to support -practically and politically- the refugees and migrants movement and to acknowledge it as one. These people, fleeing war, poverty and violence have marched to the European borders, fearless and ready to risk their own lives. The hope for a better life in peace, united them in bravery. The numerous Marches of Hope (#marchofhope) ignited a broad and transnational wave of practical solidarity. We believe that this has to be translated to political common action and therefore call all individuals, organizations, collectives and civic society movements to join their voices now, as a first step culminating on the 18th of December (global day of migration). Instead of acting on preventing this catastrophy, the political climate as manifested in the mainstream, from the segregation at Europe’s borders justified by the attacks in Paris, to the reborn war-lords, imposes a far-right narrative supported by a widespread sense of western cultural supremacy and frames a dire world without alternative. No matter how dark our times may seem, it takes only a closer look into cities, villages and neighbourhoods and the answer is there. Although seemingly paralyzed by this imposed “state of emergency”, resistance is building up in various forms, formations and formats: from the environmental justice movements, the feminist movements, the human rights activists, the self-organized spaces across the world, to the amazing people in Paris that took the streets, defying the curfew to protest in solidarity with migrants and refugees, it takes just some rays of light for the darkness to be no more. A culture of fear is imposed to become the norm in Europe and the rest of the world. A culture that aims to leave us numb in front of tv boxes and screens, after exhausting and unfulfilling working days. A culture that wants us to look away when injustice happens and keep us fragmented in front of today’s global challenges. We propose to all, to unite under the competitive narrative of a state of solidarity. Joining campaigns, actions and voices inside a narrative that hits directly in the heart of the matter. If we let fear win over our societies, the future will be taken over by it. Let’s create the space to collectively express our solidarity and messages of resistance. Let’s reoccupy our reality, meet and act on our future. In this sentence: “I oppose a culture of fear and hereby solemnly declare a state of solidarity!”, we see a potential beginning. Share and care, as always. Let’s declare a #stateofsolidarity everywhere. Call for support in Idomeni! Practically supporting the people on the move is also political! Showing that you care, too! 1) Helping hands: If you can drive there, do it! The best way to do it is with a van or a big car. The storage capacities are very limited. 2) Funds: Bring money with you! or donate directly to the volunteers. We will provide you with the info. 3) Blankets, tents, sleeping bags, food but also things like cigarettes and wood. If you manage to go there: stay connected with the volunteers already on the ground. They have been there for many weeks and know their way around. We are able to bring you in contact with them. PM us! 1) Why will they take my fingerprints again, if they already took them at the police station? At the police station the fingerprints are taken from the persons who crossed the border illegally. In the Asylum home the fingerprints are taken from the persons that ask for international protection, even if their fingerprints were already taken at the police station. The fingerprints are saved in two different databases. Rejecting the taking of fingerprints can be a reason that your request for international protection will be rejected in an accelerated procedure. Fingerprints are taken from the persons older than 14. 2) What will they do with my fingerprints? In Asylum home the fingerprints are taken for the purpose of executing the Dublin Regulation. This is an act that determines which country is responsible for your application. Fingerprints will be entered into the computer base Eurodac, from which it is evident if you already applied for asylum in another EU Member State. If you did, it is possible that Slovenia will not consider your application (it depends on when you asked for asylum in another state and how the procedure ended) and you will be sent to the State that is responsible for considering your application. The same applies if you will, after the submission of the application, leave the Republic of Slovenia and go to another EU Member State (or to Norway, Island, Switzerland, Liechtenstein) and ask for asylum there. You will be returned to Slovenia, to end your procedure. Arbitrary leave from the Asylum home and from Slovenia will be considered as an abuse of the procedure and your chances to obtain the status will be reduced. Fingerprints in the computer base Eurodac are kept for 10 years. 3) Why will they take a picture of me? You will get a card of asylum seeker with photography, with which you will prove your identity. 4) Informing – who will inform me and about what? 5) Can I change my mind and not apply for asylum? You can. In that case you will write a statement that you do not want to ask for asylum and why, and you will submit this statement to the official (inspector). 6) Will I be allowed to return home on my own, or to continue my way to where I want, if I do not ask for asylum? If you arrived to the Republic of Slovenia illegally the answer is no; the inspector will call the police which will take you to the Center for foreigners, from where you will be returned to your country. 7) What will happen with my fingerprints if I do not ask for asylum? Will the fingerprints taken at the police station be »erased«? If you will not ask for asylum your fingerprints that were taken from you in the Asylum home will not be used (will not be entered into the Eurodac base), but the fingerprints that were taken from you at the police station, because of the illegal crossing of the border, will not be erased. They will be kept in the base for 2 years. 8) I decided to apply for asylum. Why am I being asked if I already applied for asylum somewhere else, if this is evident from the EURODAC base? This is important for the assessment of your credibility; covering this data could be a reason for the limitation of your freedom of movement and for a negative decision about your status. 9) What does the procedure of submission of asylum application look like – what will I be asked? In the first part of the application you will give your personal data such as your name, last address, employment, family members, if you belong to a political party,… In the second part (statement) the questions will refer to the exact course of your travel from your country of origin to Slovenia, reasons, why you left your country and if you were ever persecuted for reasons of race, nationality, religion, membership of a particular social group or political opinion. It is important that you describe exactly all the events that relate to the reasons why you left the country. 10) Why should I repeat all this, if I already wrote a statement at the police station? Is that not enough? No, at the police station you wrote the short statement with which the inspector of the Asylum home will be acquainted before the submission of your application. In Asylum home you will be interrogated more exactly about the reasons that forced you to leave your country. It is in your interest to explain all the reasons as precisely as possible, because it is not necessary that you will have another interview. 11) For which reasons can I ask for protection? Even though you can state any reasons, you should know that not all the reasons are of a kind to get the protection from another state. Asylum (refugee status) is granted for exactly determined reasons that are: persecution for reasons of race, nationality, religion, membership of a particular social group or political opinion (those are the reasons as contained in the Geneva Convention and in the Slovenian International protection Act). Persecution means that your human rights were severely violated in your country of origin; either by one sole action, which was of extreme gravity, or by repeating actions. Different actions are relevant, for example, physical, psychological, sexual violence, discriminatory judicial or administrative measures… Persecution should be performed by state organs, such as police, army, state officials, etc. If you claim that you were persecuted by non-state actors (for example neighbors), you need to prove that you tried to get protection from state agents, but your state cannot or does not want to protect you. Even if you were not persecuted and therefore you do not fulfill the conditions for refugee status recognition, you can be granted a subsidiary protection status, if there exists a real risk that upon return to your country you would suffer serious harm (death penalty, execution, torture, inhuman or degrading treatment, serious and individual threat to a civilian’s life or person by reason of indiscriminate violence in situations of international or internal armed conflict). 12) I do not understand the interpreter very well – what should I do? It is very important that you understand the interpreter; if you do not, you need to tell this immediately to the official (inspector)! If you will not be able to solve this problem with the use of other words or dialect, the inspector will have to provide different interpreter without charge. You can also provide your own interpreter, but you will have to pay him by yourself. If you had any difficulties in communicating with the interpreter, you can submit a note on the record, at the end of the submission of the application. 13) Why do I need to sign each page of the record and why do we need to read everything all over again? The purpose of reading of the record is that you make yourself sure that everything in the record is as you have said it, since changing your statement later in the procedure can represent a reason for rejection of your application. If something is miswritten or is missing, you need to notify the official (inspector) immediately, in order for the notes to be written down. The signature of each page means that you agree with what is written. 14) Is the procedure confidential or everybody will get to know my story? The procedure is confidential, which means that nobody will find out about your procedure, therefore there is no reason to keep something a secret. The inspector will notify you about this as well. 15) I already asked for the protection in another state, but I did not get the status. Is this important? Yes, it is important. In Slovenia you will submit the application (the first interview) and then it will be decided which country is responsible for considering your application. It is possible that this will not be Slovenia, but the state, where you first asked for asylum. In this case you will receive a decision that Slovenia will not consider your application and which state will do it. In the case that you returned to your country of origin after you asked for asylum at the first place and new events happened, which for you mean new reasons for asylum, it is very important to bring them up. 16) I already asked for the protection in Slovenia. Will now the submission of the application be different? a) YES, if your first application was finally rejected or you withdrawn your application. In this case you will submit the application anew. You should focus on the reasons and on the time after you left Slovenia. Difference is that you need to submit ALL the evidence that show that you fulfill the conditions to obtain a status of refugee, already at the submission of the application, because you will not have a second chance. b) NO, if you arbitrary left the Asylum home. In this case you will submit a »classical« application. 1) For which reasons can my freedom of movement be restricted? 2) Which personal documents are important? Official documents with picture, such as: valid passport, valid ID card, birth certificate, driving license, etc. 3) What if I receive the documents afterwards? Is it enough if they send me my documents by fax or by e-mail? The document needs to be original. When you receive it, you need to hand it over immediately to the official (inspector), who manages your procedure, in order to examine if it is original. In the case of the suspicion that the document is not original, it will be sent to the expert for analysis. If your freedom of movement is restricted only for this reason, the measure will be abolished. If your freedom of movement is restricted for some other reason as well (for example for suspicion of abusing the procedure), it will continue to be restricted. 4) What is the abuse of the procedure? Several actions can signify the abuse of the procedure. Here are only some of them: fake presentation of the reasons, your statements are contradictory or in contradiction with the publicly accessible information about your country of origin; if you did not ask for asylum in the shortest time possible (usually this means the same day), rejection of taking your fingerprints and photographing, stating fake data about yourself and submission of falsified documents. 5) Who decides if my freedom of movement will be restricted and what can I do in order to avoid it? The inspector who will accept your application decides about this at the end of the submission of the application. You will be announced orally, for which reasons your freedom of movement will be restricted. This reason will be as well contained in the record and later in a written decision that you will receive. Against mere oral announcement you cannot complain, you can only complain after 48 hours, when you receive the written decision. If within this deadline you do not receive the decision, you need to turn to the official immediately and to the counselor for refugees. The complaint is lodged with the help of the counselor for refugees. You can get the list of counselors from the official person. 6) Where will I be lodged during the restriction of movement? Three locations are possible: the area of entire Asylum home, the closed part of Asylum home or Center for foreigners. 7) How long does the limitation of movement last? Until the reasons ceased to exist, but not longer than 3 months. It is possible that after 3 months the measure is prolonged for another month. In this case you need to get a new decision, already before the expiration of the 3 months deadline, where it is explained why the measure was prolonged. You can complain against this decision to the Administrative court as well. If during this time you withdraw your application, the restriction of movement ceases as well. 8) Can I complain? Who will help me at this? You can complain to the Administrative court (and later to the Supreme Court if necessary). The complaint is lodged by the counselor for refugees, who you choose by yourself. 9) How fast is this procedure before the court? Will I be able to talk with the judge? Will the interpreter be there as well? The deadline to lodge a complaint is 3 days from the reception of the written decision (first day is the next day from reception of the decision, even if holiday or weekend). The court calls the hearing within one week, which you will attend together with your lawyer. The interpreter will be there as well. 10) If the court decides that there are no reasons for the restriction of movement – will I be released immediately? The court can reject or grant your complaint. In the case of the latter, there are two possibilities: the measure is abolished or the inspector complains to the Supreme Court if he does not agree with the Administrative court’s decision (in this case your freedom of movement is still restricted). If the Supreme Court agrees with the inspector’s complaint, your freedom of movement will be restricted for as long as it was determined in the decision. If the Supreme Court agrees with the Administrative court that there are no reasons for the restriction of movement, the measure will be abolished. 11) What are my rights during the time of limitation of movement? Except that you cannot move freely, you have all the rights, as other asylum seekers. 12) Does the limitation of movement mean that I received a negative status decision as well? No, these are two different procedures. But it is true that an asylum seeker whose freedom of movement was restricted because of the suspicion of abusing the procedure, most of the time (but not necessary), receives a negative decision in asylum procedure for the same reason as well. 1) What is now my status and what is the difference with the time before submission of the application, when I was in pre-reception area? Now you have a status of asylum seeker (you are no longer an alien); until the procedure becomes final no one can deport you from the country; you also have rights, as guaranteed by the law to the asylum seekers. 2) Where will I be lodged? In one of the departments of the Asylum home: department for families, department for single men, department for unaccompanied minors, department for women, department for restriction of movement. 3) How long will I wait for the decision? I heard that some people wait for more than a year, while others get it in few weeks? Each case is different. According to the law you would need to receive the first decision in 6 months. If this will not be possible, you will be notified in writing, together with the information on when you can expect the decision. It depends as well whether your application will be assessed in regular or accelerated procedure. 4) What is the difference between the regular and accelerated procedure? In the regular procedure you have one more interview and the content of application will be assessed. The result of this procedure can be a negative decision or recognition of a refugee or subsidiary protection status. In accelerated procedure there is no additional interview; it is examined if some of the conditions to reject the application as manifestly ill-founded are fulfilled (negative decision). 5) What if I find out afterwards that I should add something or if I obtain new evidence? You should go to the official (inspector) who manages your application to write those additional reasons on the record, or to submit new evidence. You can do this in a set deadline, or until the end of the second interview. If you wish, the inspector needs to issue you an attestation about this. 6) When can I speak with the official (inspector) and who decides about my application? You can see the inspector within the official hours (the list is on the notice board at the entry); for the name of the inspector that manages your case, you can ask social service or representative of the non-governmental organization. 7) I got the deadline for the submission of evidence. I tried to obtain them, but it turned out that the deadline is too short. What can I do? In the set deadline you need to call on the official (inspector) who decides about your application and you need to explain this to him and ask for the extension of the deadline. Not respecting the deadline can have negative consequences for you (negative decision). 8) Why the inspector does not find out by himself if it is true what I am saying (for example he can call the relevant office in my country)? The inspector or the Ministry of Interior (this is the competent authority) is by the law not allowed to contact the authorities in your country of origin and ask questions about you, in order to guarantee the confidentiality of the procedure and your need for protection. However, the inspector will obtain the information which is publicly accessible. 9) What counts as evidence? 10) Will I be invited to another interview? Not necessary, since the accelerated procedure can be conducted before additional hearing, therefore it is important that you tell EVERYTHING about your story already when submitting the application. 11) I do not have money for the attorney. Who will help me? 12) The counselor told me that I need to pay for his services. Is therefore not true that he works free of charge? Do I really need to pay him? A counselor for refugees gets payment from the Ministry of Interior. For the asylum seekers his work is free of charge. If he demands a payment from you, we suggest you to look for another counselor for refugees and report the one that asked for payment to the non-governmental organizations and to the management of the Asylum home. However, payments for the representation at submission of the application and at the hearing (interviews in the Asylum home) need to be arranged with the counselor, since this is not paid by the Ministry. 13) How can I contact a counselor for refugees? Upon the arrival to the Asylum home you received a list with the names and telephone numbers. You call the counselor by yourself, or with help of social service or representative of non-governmental organizations. 14) What can I do if I cannot communicate with the counselor because of the language? You should look for the help of the representative of non-governmental organizations or an asylum seeker, who you trust. An interpreter, you will need to pay by yourself. 15) The counselor will lodge a complaint. What follows? You need to wait for the decision of the Administrative court. If the deadline for lodging the complaint was 3 days, the court will have to decide in 15 days; if the deadline was 15 days, the court has 30 days to decide. In practice these deadlines can be longer, particularly in the summer. You are still an asylum seeker and you cannot be deported! 16) Can the court grant me the status? No, the court does not grant the status. Positive decision from the court means that the court agreed with the statements in the complaint; the court most often returns the matter to the inspector for the renewed determination. However it is not necessary that the inspector will conduct the renewed procedure right away, since he can complain to the Supreme Court against this decision. 17) What can I do if I receive a second negative decision? If you receive a second negative decision from the Administrative court (the court rejected your complaint) you can complain against this decision to the Supreme Court. 18) How long will it take for the Supreme Court to decide? By the law, the Supreme Court needs to decide within 15 days. 19) Will I go to the court for the hearing? How will the judge know what is true, if he will not speak with me? No! The judge will decide only on the basis of the files (decision, complaint, evidence). The judges do not have official hours where you could talk to them. 20) I obtained new evidence – can I send it to the court? You can, if the evidence already existed at the time when the inspector was deciding about your application and you legitimately could not submit it. If you could submit it to the inspector, then the court will not be allowed to take it into consideration. 21) Will the court send the judgment to me or to my attorney? If you have an attorney, the court will send the judgment to him and the attorney needs to notify you. 22) I am not satisfied with the attorney. What can I do? You can revoke his mandate in writing, and then authorize another attorney. We suggest that you previously agree with another attorney, so that you will not stay without attorney. You should also find out if this is reasonable, considering in which phase of the procedure you are. 23) What happens if I am unsuccessful at all three instances? With the notification of the negative judgment by the Supreme Court (regardless whether this is 2. or 3. negative decision) you become an alien and you do not have a right to accommodation in the Asylum home. In the judgment is also written that you need to leave Slovenia immediately. In few days the police will take you to the Center for foreigners, where the procedure for extradition to your country begins. 24) Can I leave Slovenia voluntarily? If you arrived to Slovenia illegally or if you are without documents or if you do not have any other legal basis to stay in Slovenia, then you CANNOT. 25) My application for asylum was rejected. Can I ask for subsidiary protection? No, because this was already decided within the procedure. During the procedure it is first examined if the conditions for recognition of the status of refugee are fulfilled. If not, the conditions for recognition of subsidiary protection are examined as well. This is a unified procedure; therefore 2 different applications are not possible. 26) Is there any other possibility after I receive the negative decision from the Supreme Court? What about European Court of Human rights (ECtHR)? It is possible to lodge the constitutional complaint to the Constitutional Court in 15 days from the notification of the Supreme Court judgment, but only if during the procedure your constitutional rights have been violated. At the same time you should ask for the withholding of the Supreme Court’s judgment to leave Slovenia immediately. During this time you are not lodged in the Asylum home, but in the Center for foreigners, or if your request is granted, in a private address. Only when this possibility is exhausted, you can complain to the ECtHR. 27) How can non-governmental organizations help me during the procedure? Several non-governmental organizations are active in the domain of international protection. Some offer psychosocial help (different workshops, trips, discussions), other are dealing with research and do not have direct contact with asylum seekers. PIC offers legal help: counseling, also representation before the court. 28) I was granted the status of international protection. What about my relatives who are still in my country of origin? Can they join me? You can ask for family reunification with your family members: spouse or marriage-like partner, minor, unmarried and without means children, and in the case that you are an unaccompanied minor, with your parents. It is important that the persons are members of a family that already existed in your country. If the request will be granted, they will obtain the same status as you. 29) I asked for asylum in Slovenia. I have relatives in another EU country. Can I reunite with them? You can ask for family reunification with a family member that is your spouse (or marriage-like partner), minor, parent (if you are an unaccompanied minor), who has a status of refugee or a status of asylum seeker in another EU Member State. International protection in Republic of Slovenia means status of refugee and status of subsidiary protection. Note for the following text: this is so far only a proposal – not yet decided as official law/policy. 1) Refugees would now only get a three year permit, with a one year extension. Including refugees under 18 (and their families) except those already registered in sweden. Permanent permits are available only for Unhcr quota-refugees. If you can show sufficient income level at the end of your temporary permit – this may be turned in to a permanent residence permit – otherwise you may get your temporary permit prolonged with One year at a time, if your claims for protection still stands. years of age to be reunited. The refugees on a one-year protection permit cannot be reunited with their families. You will also have to show ‘sufficient income level in order to be granted family reunification. 3) With the exception of children, there will be even more restricted possibilities for humanitarian residence permits. 4) The government wants to increase the use of medical determination of the age of asylum seekers, despite it being condemned as completely unscientific by medical staff. Since yesterday the states of Macedonia, Serbia, Croatia and Slovenia are separating migrants due to their (supposed) nationalities by racial profiling. Obviously the IOM and UNHCR are collaborating with the governments in this issue. The goal of the governments is to prevent those from entering their countries, who are not of (supposedly) Syrian, Iraqi and Afghan origin and to weaken the power of the migration movement. It is not clear what will happen now to those who are separated and prevented from entrance. It is not recommended to sign any paper, which you cannot read. Always ask for translation into your language and ask what are the consequences of signing. There were reports from the Greek-/Macedonian border, that people who had lost their Greek registration papers had to show their ID to enter into Macedonia. This can be very difficult and problematic, so keep an eye on your Greek papers. We demand to immediately put an end to the practice of racial profiling and to guarantee freedom of movement for everybody! Das Lebensmittelspenden-Lager in Wagna hat heute, Samstag, von 10 – 13 Uhr geöffnet und freut sich vorrangig auf frisches Gemüse (Details siehe unten stehend), sowie Einweg-Schüssel und Einweg-Löffel. Wir von Border Crossing Spielfeld sind Menschen und Initiativen, die an der Grenze in Mureck, Ehrenhausen und Spielfeld verwurzelt sind und versorgen Euch weiterhin mit aktuellen Infos, wo und wie ihr aktiv werden könnt! AKUTER Spendenbedarf (Details siehe unten): Babybodies (insbesondere für Neugeborene) Babywundcreme, Windeln Gr. 1 und 5, Taschentücher, Schuhe in allen Größen. Gemüse für die TWO Küche (Zucchini, Melanzani, Lauch – abzugeben im Lebensmittellager in Wagna). Der Zugang zum Grenzübergang Spielfeld wird von der Polizei (meist) nur angemeldeten Freiwilligen erlaubt. Der Einsatzort befindet sich im Stadtgraben gleich vor dem Grenzübergang rechts. Anfahrt Lager Sentilj: Auf der Autobahn über die Grenze fahren, die erste Abfahrt (ganz kurze Strecke) nehmen, rechts fahren bis zur Polizeiabsperrung. Sucht, wo immer ihr sie trefft, den direkten Kontakt zu den Menschen. Die Möglichkeit zu telefonieren, kurz Internetzugang zu haben (WIFI-Hotspot über das Smartphone) oder das Handy aufzuladen, ist für viele ganz wichtig. Ein Gespräch, eine Umarmung, kann manchmal mehr Kraft geben, als ein Müsliriegel. Lauch, Zucchini, Melanzani, Ingwer, Curry, gewürfelte Tomaten u.passierte Tomaten in Dosen, Knoblauch, Rote Linsen und Reis, scharfe Messer zum Gemüseschneiden. Taschentücher. Die Versorgung im Lager Sentilj ist besonders wichtig, weil Menschen, die das Transitlager Sentilj verlassen und Richtung Transitraum Spielfeld marschieren, immer wieder sehr viele Stunden auf Einlass warten müssen. Daher ist es umso wichtiger, dass sie zuvor ausreichend verpflegt und eingekleidet werden. KLEIDUNG: Gebraucht werden primär feste Schuhe in allen Größen und ohne Absätze, Socken (für Kinder,Frauen, Männer), Strumpfhosen, lange Unterhosen, warme Winterjacken, neue Unterwäsche, Hauben; wärmendes Baby- und Kindergewand. Unbedingt sortiert, separat nach Größe und Art eingesackelt und beschriftet! Immer wieder erfahren wir von SüdsteiererInnen, die spontan Menschen weitertransportieren oder mit nach Hause nehmen zum Aufwärmen, Duschen, Rasten und Essen. Es ist aber nicht so, dass immer Leute zu Fuß unterwegs sind. Organisierte Konvois für private Mitfahrgelegenheiten machen derzeit daher keinen Sinn, nur im Falle, wenn wieder große Gruppen auf der Strasse unterwegs sind. Der Transitraum befindet sich am Bundesstraßengrenzübergang. Abfahrt Spielfeld, am Kreisverkehr Richtung Grenze, nach 1 km erstes Grenzerhäuschen, linkerhand der Transitraum. Das Versorgungszelt und die Einsatzleitung des Roten Kreuzes befinden sich im linken hinteren Teil des Geländes (Rot-Kreuz-Fahne). Auch wenn am Kreisverkehr die Polizei die Zufahrt zur Grenze absperrt, werden TeamÖsterreich-Mitglieder, die sich für eine Schicht registriert haben, durchgelassen. Bitte auch auf Posts und Kommentare der UnterstützerInnen vor Ort zu diesem Update achten. Sie zeigen den aktuellsten Bedarf an, der allerdings auch nur kurzfristig aktuell sein kann. Wir danken jeder und jedem einzelnen, die/der sich engagiert! Ihr seid einfach Klasse. Wir freuen uns über so viel Menschlichkeit! We at Border Crossing Spielfeld are grassroot initiatives from Mureck, Ehrenhausen and Spielfeld. We are providing activists with up-to-date information to enable you to get active on the ground. Access to Spielfeld border crossing is (usually) only permitted to volunteers who have registered in advance. How to get there: Take highway exit ‘Spielfeld’. Go left at the round-about. There is a police check point where you will be asked if you are registered before entering. Go straight for approximately 1 km. The transit area is to your left. You will find RC headquarters, kitchen and food distribution point at the left rear section of the area. For people residing outside Austria we suggest registering option 1 and 2 or border crossing Radkersburg. 1) MOBILE KITCHEN of the association TWO. No residency in Austria required. You have to put your name on the doodle-calender AND send an e-mail to two.helfer@gmail.com. Please insert the following data into the e-mail headline: full name, the date you want to volunteer, day or night (i.e. Angela Davis, 04 november, night); please put your phone number into the email as well. The association will pass on your name to the police so you will be allowed to pass at the check point. Please send data within 8pm latest for the day after. 3) CARITAS: No residency in Austria required. Only possible for people who have their residency in Austria. Registering includes insurance. It is possible to register for 6 hour shifts or for shorter ones. The transit area is right at the border crossing (white tents, blue containter). Use the highway border crossing to Slovenia, take the first exit after a very short drive, go right and right and stop at the police blockade. – Tea bags (black tea), blankets, sleeping pads, knives for cutting vegetables, spices. For the time being only children’s clothes and shoes are being collected at the border crossing. Please assort and pack them beforehand. Drop off is shortly before the border crossing to Slovenia to your right (white tents, blue container). How to get there: Use the highway border crossing to Slovenia, take the first exit after a very short drive, go right and right and stop at the police blockade. We receive different information as to wether it is possible to drop of donations there. Some volunteers succeded, unders were redirected to Karitas in Maribor (only a 30 km drive). The priest in the parish close to the camp was reported to collect donations and bring them to the camp. 3) CLOTHES: Warm trousers, winter-jackets, socks for men women and children; Winter shoes (no heels). New underwear, especially for women. Assort and pack clothes and write content on the package please. We frequently hear about people picking up families from the street, giving them a ride to the station or taking them home for a rest, a shower and a meal. Anyhow, we do not constantly see people walking at the main road B67. That is why, for the time being, organized convois don’t seem to make sense. We will keep you updated on bigger numbers of people on the move. MOMENTAUFNAHME GESTERN 22 Uhr: Das Lager in Spielfeld war abends völlig leer. Alle Menschen waren in Notunterkünfte und Richtung deutsche Grenze gefahren worden. In den nächsten Tagen werden aber bis zu 30.000 Menschen erwartet. Haltet Spenden und Kräfte für den Einsatz vor Ort bereit! Gemeinsam können wir viel bewegen! AKUTER Spendenbedarf (Details siehe unten): Babybodies (insbesondere für Neugeborene) Babywundcreme, Windeln Gr. 1 und 5, Taschentücher, Schuhe in allen Größen, Gemüseschneidmesser. Seit 8.11. können Freiwillige dank einer Abmachung zwischen ARE YOU SYRIOUS und den slowenischen Behörden Menschen im Niemandsland versorgen. ENDLICH! Bitte Namen, Geburtstag, Staatsangehörigkeit und Telefonnummer angeben. Ohne Anmeldung kein Zutritt zum Niemandsland. Bitte Bestätigung der Koordinatorin abwarten. KONTAKT Sandra Schober vom Roten Kreuz 06645146532; bzw RK Leitstelle 03476/21440. Der Einsatzort befindet sich im Stadtgraben gleich vor dem Grenzübergang rechts. For people residing outside Austria we suggest registering option 1, 2 and 3. There is no access to the no man’s land without registration. 2) MOBILE KITCHEN of the association TWO. No residency in Austria required. Contact: Sandra Schober (Red Cross). The transit area is right at the border crossing (white tents, blue containter). Our initiative “Are You Syrious?” was finally allowed by Slovenian authorities to enter no-mans-land (NML) and we are accredited for providing help to people waiting to enter Austria there. Until now the conditions in NML were very bad, no one could provide food, medical help or clothing and people were waiting for hours, after already a very painful journey. Right now we are organizing our stand and from tomorrow morning we will be fully functional. Please apply through our on-line registration system http://www.volunteerspot.com/login/entry/12165790680126. Additionally you MUST write your personal info – date of birth, nationality and phone number in comments on volunteerspot. IF YOU DO NOT REGISTER YOU WILL NOT BE ABLE TO WORK ON THE FIELD. DO NOT COME TO ŠENTILJ WITHOUT REGISTRATION AND CONFIRMATION FROM OUR COORDINATORS. Any other questions about volunteering should be address to our daily volunteer coordinator (the contact is on info post pinned to the top of our profile, at the bottom of the post). We are going to take care of a few thousand people per day and we need donations of non-perishable food (canned food, bread, cheese, baby food, energy bars, snacks, biscuits, chocolate..), water, milk, juices, fresh and dry fruit, raincoats, blankets, sleeping bags. 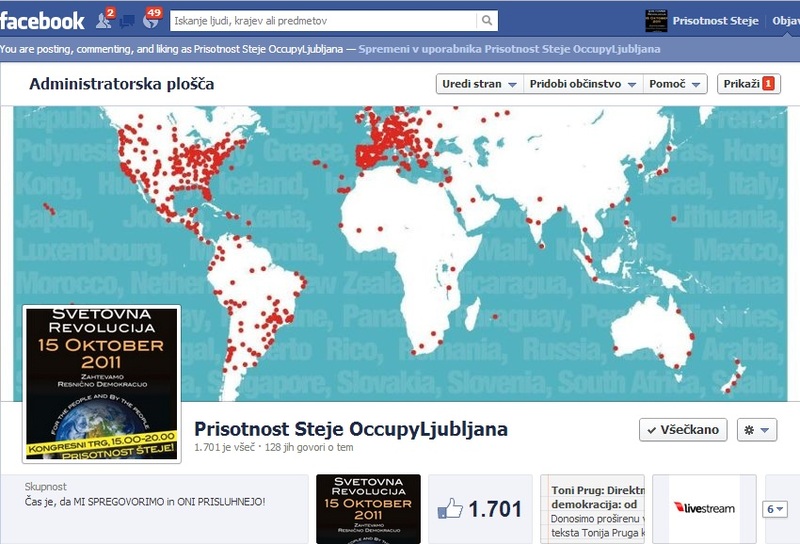 Donations can be submitted to Medika (Pierottijeva 11, Zagreb, daily 5 – 8 PM). If you have larger quantities of donations or you are outside of Zagreb/Croatia, please contact us for further instructions. You can send us a message in our facebook inbox or you can contact our daily coordinator for Medika or large storages (contacts are on info post pinned to the top of our profile, at the bottom of the post). Thank you! Together we can help!!! Most of the refugees, crossing via Bulgaria, arrive in Dimitrovgrad, a little town, that is 4 km from the Serbian-Bulgarian Border and 60m away from Sofia, the capital of Bulgaria. 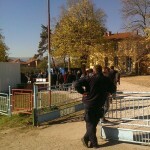 They have to register at a camp, that is managed by the Serbian border police. Some are walking days before they finally arrive the police station. Taxi Drivers are waiting in front and offer a ride to Belgrade for 200 Euro. 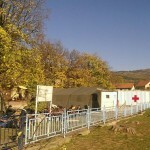 The volunteers camp is located in the same area as the police station with the tent of the red cross and the presence of the UNHCR. At the end of the working day, the representation of the UNHCR and the Red Cross closed before 4 pm. After the registration process, they have to leave the country within three days. 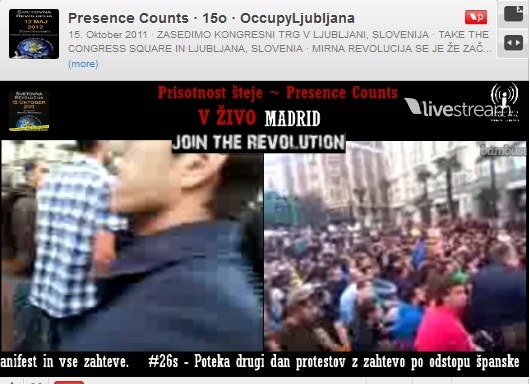 Usually they buy a bus ticket to Belgrade for 25 Euro, money that is sometimes provided by volunteers. Aziz, the father of a young family told us the situation at a detention center, next to Sofia: „I saw 3 families in Busmantsi. They are there since weeks. Some people are staying 2 days, some even month. I don’t know, what is the Bulgarian system.“ He later told us about his friend, being controled by police, that was supposed to „pay 20 Leva (10 Euro) for nothing“. 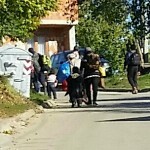 The situation for refugees in Bulgaria is continuously criticized by several NGOs. The Bulgarian Helsinki Committee stated recently, that “duration of the asylum procedure has increased on average from 3 to 6 months and is still growing“ in Bulgaria, as well as interpretation service could not be provided. Not everybody, who is trying to escape the situation in Bulgaria, can cross the border. The recently published report, of the BHC in cooperation with ECRE, shows that 2,199 people where caught at the border when they wanted to leave the country, only in the first half of 2015.